Ligaments, tendons, cartilage and muscles working together are necessary for the horse‘s flexibility and performance. The bones need the connective tissue for their position and for their mobility. With derbymed Flexotendon inflammations can get soothed and the self-healing process gets supported. 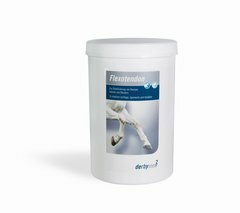 The nutrients promote the stability and resiliency of the joints by growing horses and older hard working horses. MSM is an organic sulphur compound which has an resonance effect for the connective tissue and the joints. It encourages the resilience of joints and ligaments. Collagen is an essential component of the connective tissue. With an inadequate collagen production comes to a weakening of connective tissue and ligaments. Devil‘s root have anti-inflammatory properties which helps in case of arthrosis.